The Royal Naval Cemetery, Portland contains the graves of seamen serving at the Portland naval base from the 1870s to the present day.There are Commonwealth War Grave Commission headstones from both World Wars, graves of sailors who died in accidents both on board and on shore, a few graves of servicemen's wives and children, and headstones for several German airmen brought down locally in WW2, and also Italian and a Japanese sailor. Access to the cemetery is by footpath from Verne Common Road (look for a path sign on the left hand side going up and park on the verge). The weather conditions were murky on my visit and this has reduced the quality of the photographs. The GPR holds 520 grave and 584 person records for the military cemetery. 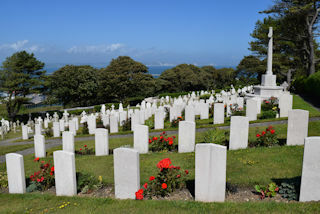 The status of the photographing of the military cemetery is believed to be complete. There have been 19 requests for photographs from the military cemetery.